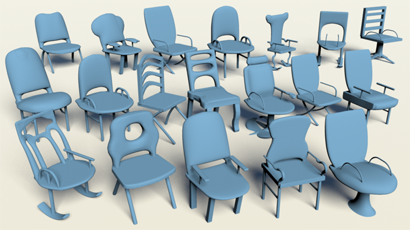 An example of creating a chair model using our system. The user successively draws freeform strokes (red) to express his design concept on the screen. Our system automatically returns the corresponding 3D parts and dynamically provides shadow guidance to the user for further drawing. 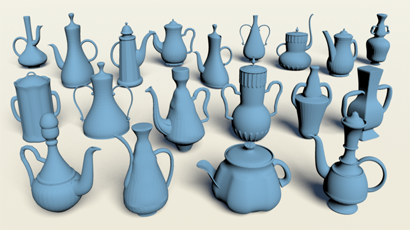 (a)-(e) shows strokes specified by the user, shadow provided by our system (the upper row) and the corresponding 3D models generated in our system (the lower row). 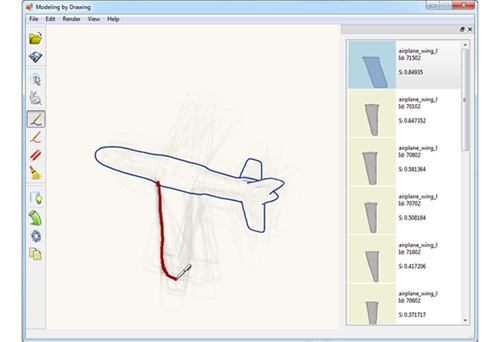 The user can also edit the part by drawing near the silhouette of the model (e). (f) shows the final model generated by our system. 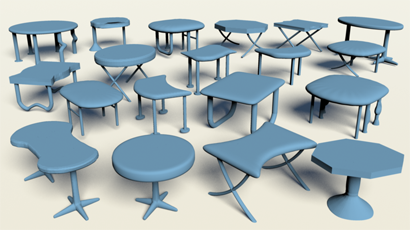 Modeling 3D objects is difficult, especially for the user who lacks the knowledge on 3D geometry or even on 2D sketching. In this paper, we present a novel sketch-based modeling system which allows novice users to create 3D custom models by assembling parts based on a database of pre-segmented 3D models. Different from previous systems, our system supports the user with visualized and meaningful shadow guidance under his strokes dynamically to guide the user to convey his design concept easily and quickly. Our system interprets the user's strokes as similarity queries into database to generate the shadow image for guiding the user's further drawing and returns the 3D candidate parts for modeling simultaneously. Moreover, our system preserves the high-level structure in generated models based on prior knowledge pre-analyzed from the database, and allows the user to create custom parts with geometric variations. We demonstrate the applicability and effectiveness of our modeling system with human subjects and present various models designed using our system. A screen shot of our system. The canvas for drawing is in the middle, and an evolving shadow image is presented under user's strokes. The suggestion panel displaying the sorted list of candidate parts is shown on the right. Common tools are displayed on the left. System pipeline. The user can construct a 3D model in a part-by-part fashion. As the user draws on the canvas, our system interprets user's strokes as similarity queries into database to compose the shadow image and return the corresponding candidate 3D parts. Then the system assembles the selected part by taking user's strokes and prior knowledge as hints. The user can draw strokes near the added parts to make variations. 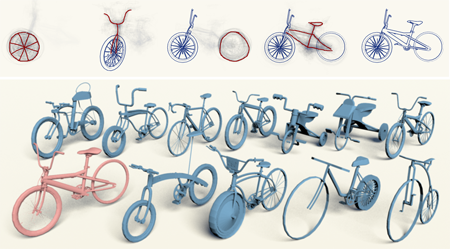 Bottom: bicycle models created by users using our system. Top: modeling session of the red bicycle. 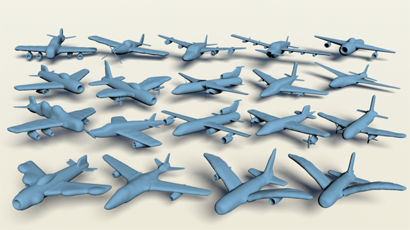 3D models created by users using our system. We would like to thank the anonymous reviewers for their constructive comments. This work is supported by the National Natural Science Foundation of China (61222206, 61073108, and 11031007) and One Hundred Talent Project of the Chinese Academy of Sciences.